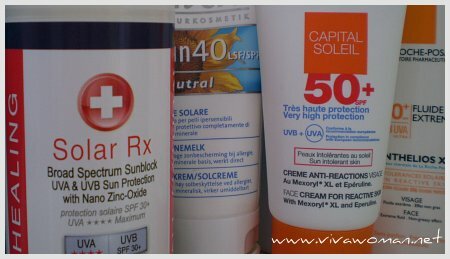 I have been receiving a number of emails from readers asking me to help them evaluate their choice of sunscreens; most of the questions centered around whether their product of choice offer sufficient broad spectrum protection againstÂ UVA and UVB rays.Â I have actuallyÂ written anÂ entry regarding theÂ effective active ingredients in a sunscreenÂ but today, I’ll talk about three groups of active ingredients which I consider to be the best for sunscreens. This isÂ my favorite sunscreen ingredient becauseÂ it has worked well for me and it is the choice of ingredient used in most of the naturally formulated sunscreens. Sometimes listed as ZnO, this ingredient isÂ a physical blocker in sunscreens and deflect rays like a mirror instead of diffusing them. In certain formulations, this ingredient also leaves an unattractive white cast on the skin but itÂ offers fullÂ broad spectrum protection on its own.Â If your sunscreen contains only Zinc Oxide,Â my understanding is that the content should be atÂ least 16% to be effective.Â If the content is lower, it should be combined with other active ingredients and usually, it’s Titanium Dioxide. However, a high amount of zinc oxide canÂ be too drying for some skin type and as such, might lead to breakouts. According to information from the Environmental Working Group, Zinc Oxide is rated to have a moderate health hazard with a rating of 4. Many sunscreens especially mineral-based ones contain Zinc Oxide.Â I use Marie Veronique Face Screen Plus which contains 24% Zinc Oxide. 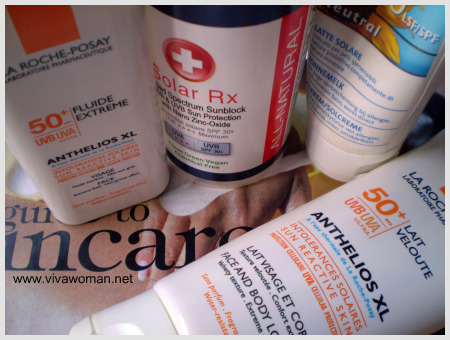 For sunscreens containing Mexoryl, you can look at those from L’Oreal,Â La Roche-Posay, Kiehl’s or Vichy. Tinsosorb S is also known as BemotrizinolÂ (bis-ethylhexyloxyphenol methoxyphenyl triazine) and Tinosorb M is also known as Bisoctrizole (methylene bis-benzotriazolyl tetramethylbutylphenol).Â Â These two ingredientsÂ are hybrid chemical UV absorbers and reflectors manufactured by Ciba, widely available in European brands of sunscreens, but have yet to be approved by FDA. Tinosorb SÂ is oil soluble while its counter part Tinosorb MÂ is water soluble and both are said to be highly photostable, working as a physical sunscreen and a chemical sunscreen, shielding and protecting the skin. And according to information from the Environmental Working Group, Tinosorb S has no health hazard rating but Tinosorb M has a low health hazard at level 1. 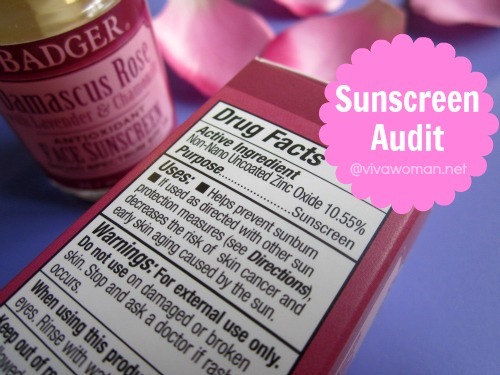 For sunscreens containing Tinosorb, you would want to look at products from Avene, Bioderma, Eucerin, RoC and Uriage. Most mineral-based sunscreens or physical sunblocks contain only Zinc Oxide and or Titanium Dioxide.Â If yours fall under this category, make sure it has sufficient Zinc Oxide.Â Most chemical sunscreens include a myraid of sunscreen filters.Â However, the two I’ve covered – Mexoryl and Tinosorb – are considered photostable and offer protection against both UVA and UVB spectrum.Â Your best bet are using sunscreens containing either of the two groups.Â Personally, I’ve used chemical sunscreens containing Mexoryl when I’m out under the sun for a prolonged period of time and have found them to be photostable. why does there need to be at least 16% zinc to be effective? 16% of non-micronized Zinc Oxide should provide an SPF of around 15. So the Keys Soap Sunblock which is 19% micronized zinc isn’t really SPF 30 as they claim?? According to the table, 19% micronized zinc is less than SPF 20. The table is an indication of zinc oxide alone so there’s still need to consider the formulation as a whole. I’ve read that some sunscreen ingredients like avobenzone become unstable when makeup is applied. I can’t seem to find a credible source for this claim. Could you please verify this information? Uncoated titanium dioxide (TiO2) and zinc oxide (ZnO) can degrade avobenzone so it is best not to layer non-micronized mineral makeup with an avobenzone containing chemical sunscreen. The tinted moisturiser (SPF35) I am currently using contains the following ingredients. Are these sufficient? It looks very photostable to be because it has Tinsorb M. In addition, it also has TiO2 and Octinoxcate. Looks really foolproof or should I say, “sunproof”! Thanks for the reply. I used to have minor rashes or in serious cases acne outbreak with products that contains more than SPF20. However, I recently switched to this tinted moisturiser & it has not cause any problem to my skin so far. Btw, what brand is it? The ingredients is quite clean. 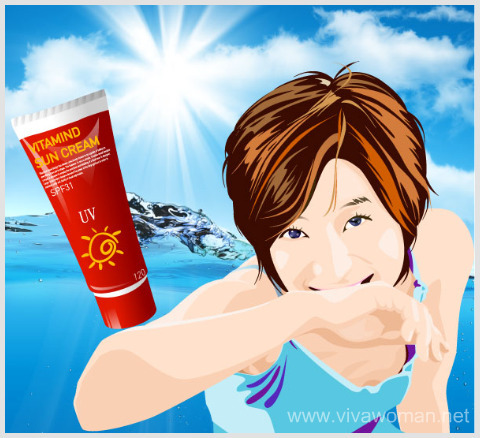 I am using Dr Wu – UV Whitening Cream With Fullerene RSâ„¢ SPF35 PA+++ (Tinted). I bought this at Guardian Pharmacy for SGD49.90. Oh okay….I was thinking it might be that brand. I’ve seen it around but never examined the product. “Most mineral-based sunscreens or physical sunblocks contain only Zinc Oxide and or Titanium Dioxide.”~ Does that imply that most sunscreen contains only one of those? I hear Titanium Dioxide is more effective. Any idea about the validity of that? If yours is a physical sunblock or sometimes called mineral-based sunscreen, it’s likely to contain these two ingredients – either one or both. But some do contain other sun filters. Titanium Dioxide only provides protection against 50% of UVA rays; Zinc Oxide is definitely more effective. My friend bought me the La Roche-Posay Uvidea when she was in Japan, and I really like it. All the sunblock in the States is really thick and gooey, so I was so surprised when I tried the Uvidea. It was so liquid-y, and easy to spread. Plus, it has Meroxyl, so I’m not so worried when I have to commute 2 hrs back and forth from home to work in this blazing sun. I may have to switch to something else for the winter since there’s no need to Meroxyl when there’s barely any sun. And its expensive. However, I love this one so much more than the John Masters Organic because I only need to blot my face once to keep the oil at bay if I decide to go out after work. I had to blot my face 3 times prior when I was using the John Masters Organic. Oh I’m glad you’re liking it! Yes, the texture is very likeable. Never tried thee John Masters Organic one but I imagine it should be rather thick. It’s actually very soothing and although takes a while to absorbs/disperses on the skin, but doesn’t leave it feeling greasy or shiny. The consistency is barely thicker than that of cleansing milk and has a very faint sunscreen scent, that disappears once you put it on your skin. I usually swear by this sunscreen, since I have yet to find on with better protection and nicer wear. Even when I’m out partying in open-air festivals for days, this sunscreen completely protects me from any sunburn or rash. Your sunscreen looks very photostable with all the different ingredients – it’s able to filter the UV rays from within your skin as well as deflect from outside. Definitely sounds like a good one for outdoor usage! I have read vaguely about micronized zinc oxide not offering sufficient protection but I’m not sure if that’s true. I need to find out more. But if you take a look at this link below, it doesn’t seem so. I’m sorry that MVO didn’t work out for you. My guess is you probably don’t use makeup? Because for me, the slight whitecast is perfect as a makeup base. I wonder if you would give their Kid Safe Screen a try because that one leaves no whitecast…or maybe cos I’m fair, I don’t see the whitecast. Thanks for your reply, it’s so helpful. I read in a previous post that you’ve been rethinking your Keys SPF. I have been doing the same. I stopped using it last summer because i feared that the micronized zinc oxide was inferior in regards to protection. How do you feel about it currently given your beliefs today? Thanks in advance! I don’t use it anymore cos nano is something I try to avoid now. In the past, I thought it was okay but the more I read, the more I think I should avoid. Plus, we have so many choices today. Btw, some of my readers suggested the moisturizer with SPF from Devita. A number of them said it’s nice…perhaps you can have a look at that. i’m currently using ponds age miracle daily resurfacing cream which has a SPF of 15 PA++ (not sure what the PA++ stands for). Because i’m undergoing laser hair removal on my face i am also using photoderm max spf100 milk. reading the ingredients now, i realise that the moisturiser contains titanium dioxide. is this perhaps making the uva+ uvb filters in the photoderm unstable? need as much Spf as possible. Also, is applying it once a day sufficient if you not washing in off? WATER (AQUA), DICAPRYLYL CARBONATE, OCTOCRYLENE, METHYLENE BIS-BENZOTRIAZOLYL TETRAMETHYLBUTYLPHENOL, BUTYL METHOXYDIBENZOYLMETHANE, CYCLOMETHICONE, ALCOHOL DENAT., C20-22 ALKYL PHOSPHATE, BIS-ETHYL-HEXYLOXYPHENOL METHOXYPHENYL TRIAZINE, PTFE, C20-22 ALCOHOLS, TOCOPHERYL ACETATE, ECTOIN, MANNITOL, XYLITOL, RHAMNOSE, FRUCTOOLIGO-SACCHARIDES, LAMINARIA OCHROLEUCA EXTRACT, DECYL GLUCOSIDE, XANTHAN GUM, AMMONIUM ACRYLOYLDIMETHYLTAURATE/VP COPOLYMER, DISODIUM EDTA, SODIUM HYDROXIDE, PROPYLENE GLYCOL, CITRIC ACID, CAPRYLIC/CAPRIC TRIGLYCERIDE, PHENOXYETHANOL, METHYLPARABEN, PROPYLPARABEN, ETHYLPARABEN. This is a chemical sunscreen with a few sun protection chemical absorbers including Tinosorb, which is supposed to offer high UV protection. So in terms of protection, it should be quite good. thanks you for the prompt reply…is once a day sufficient though? the only sun i really get is driving to and from work…i’m a skin type V.
Should be sufficient since it’s only casual sun exposure. also… what should i be applying first? sunblock or moisturiser? will the moisturiser benefit my skin if applied over the sunblock? or vice versa? Since you are using Photoderm max, which is a chemical sunscreen, you should apply this first and wait about 10 minutes before applying moisturizer if possible. I had been using hydroquinone for 4months last year when i decided to stop and use kojic acid and arbutin cream for my face to whiten. I was using VMV armada spf 60 ever since and it was giving me a very good protection until After 4months, i am noticing that my face is darkening. I am exposed to sun most of the time because i am a sales representative but i am using umbrella and putting sunblock 3x a day. Do i need to change my sunblock for better protection? Ingredients are zinc oxide, phenybenzimidazole sulfonic acid, titanium dioxide, butyl methoxydibenzoylmethane, 4 methylbenzylidene camphor. Thank you. Your sunblock sounds like it has good sun protection ingredients but I wonder what’s the mix. Plus you apply 3x a day! Are you using kojic and arbutin cream in the day too? Hey i use suncros soft gel sunscreen which includes cyclopentasiloxane, zinc oxide( micronized) , c12-15 alkyl benzoate, dimethicone crosspolymer, caprlyl methicone, isostearic acid, polyhydroxystearic acid , PEG-12 dimethicone/PPG-20 crosspolymer, tocopheryl acetate… it mentioned that it contains 25% of zinc oxide.. is it good or stable sunscreen?? As my concern are freckles.. plzz tell me is my sunscreen is good?? ?